Spend some time every day playing outside with baby. That’s where many of the fun things to do in the fall are. We get accustomed to staying inside day after day where baby can play on the soft living room carpet where everything is conveniently clean and safe. Don’t miss out on all the fun exploration you and baby can experience together outside. Let baby get dirty. Don’t worry if baby gets a little dirt in his mouth or on his clothes. That’s what being outside is all about. Experience different sensations. The tickly feel of the grass, the grittiness of sand, and the dirty the rough feel of rocks. These are all important sensations for baby to get used to. Hands-on play. Pick up various objects and textures outside and feel them together with baby. Verbalize each sensation – “The rock is hard”, “The grass is soft”. Bug fun. Teach your toddler not to fear bugs. Explore lines of ants, spiders in webs, fuzzy caterpillars, squirming worms, slimy snails, and anything else your child finds. Put his favorite in a jar and enjoy it indoors for a few days. Wash those hands. Teach your child about the importance of hand washing. Let him “do it himself” with a step stool at the bathroom sink. Get baby used to these outdoor experiences at a young age and you’ll have a hard time keeping him in the house when he’s older. The leaves hit the ground only once a year. Take advantage of this time to enjoy some creative and fun things to do in the fall with your child. Sweeping and raking. Kids love to help mom or dad do some outside work (at least while they’re young). 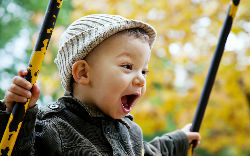 Buy your child his own kid-sized broom or rake and let him join in the fun. Jumping games. Set baby’s step stool in the middle of the pile of leaves and clap while she jumps off. Kicking games. Kick your way through the leaves together. Color piles. Help your toddler separate the leaves into different color piles. Counting. Teach your young child early counting games as you count leaves of various colors. Teach your child how much fun the outdoors can be and she’ll enjoy the fun and exercise of being an outdoor kid as she grows over the years. Throughout the month of October you will have some unique opportunities for learning and playtime with your infant and child. Messy pumpkins. Some kids love to get their hands messy, and there’s no better way than the inside of a pumpkin. Let your child clean it out for you. Funny faces. Let your child design the pumpkin face with a marker. Buy several pumpkins of various sizes and have your child design one for each member of the family. Creative costumes. Don’t wait for Halloween night to play dress-up. Exercise your child’s creativity by showing her how to make costumes out of everyday items around the house. Use yarn for hair, plastic bowls for a hat, towels for capes, color masks on paper and tie them on with string, color designs on one of dad’s old T-shirts, and many other ideas. Instead of buying a costume, have your child put her favorite ensemble together for Halloween night.